Happy Hanukkah! 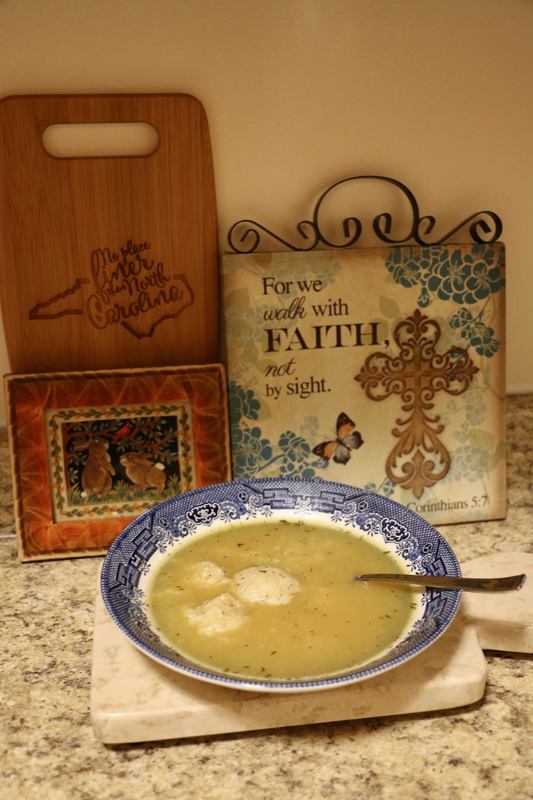 My Favorite Matzo Ball Soup Recipe. Happy Hanukkah Friends! Here's a fun fact that you probably don't know about me: I'm half-Jewish! Both sides of my dad's family are Jewish through and through, and he and his siblings were all raised Jewish in Long Island, NY. My dad didn't continue practicing his faith into adulthood (he now attends a Christian church in Maine), but growing up my parents used to celebrate a few Hanukkah traditions each December so that I could learn about that side of my family's spiritual heritage. We also had several family friends in Maine who were Jewish, so between all of them and my family out-of-state, I have attended my fair share of bar/bat mitzvahs and Hanukkah parties through the years! Although I don't practice the Jewish faith, I think it's wonderful that my parents worked so hard to make that part of my heritage apart of my childhood. One part of Jewish customs that I am a large fan of are many of the traditional foods. Yum. If you've never had a potato latke before... oh you are missing out my friend! Anyways, one of my favorite traditional Jewish meals is matzo ball soup. This is actually a recipe associated more so with the holiday of Passover, (not Hanukkah) however I have definitely gotten to eat matzo ball soup at Hanukkah parties through the years. I also think this soup is the ideal winter comfort food, so as a tribute to my family heritage, I wanted to share my own take on this tasty soup with y'all today! 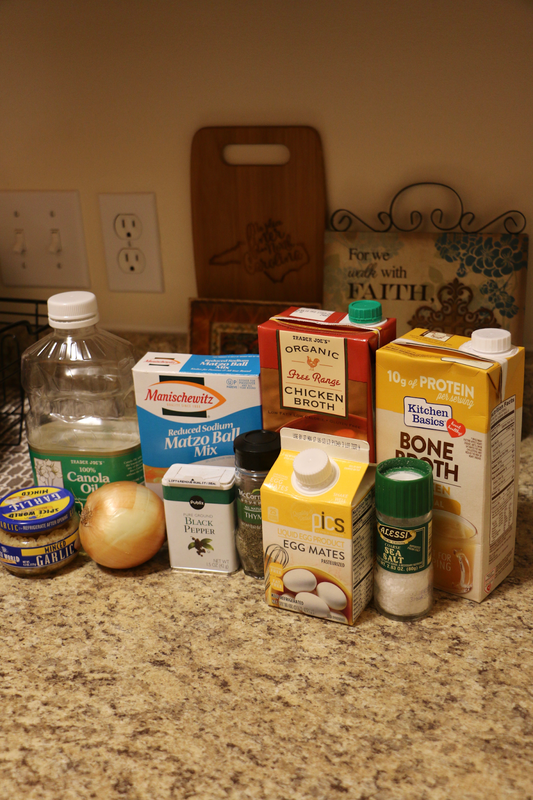 I use a box mix to make the balls, and my own made-up recipe for the broth! 1. 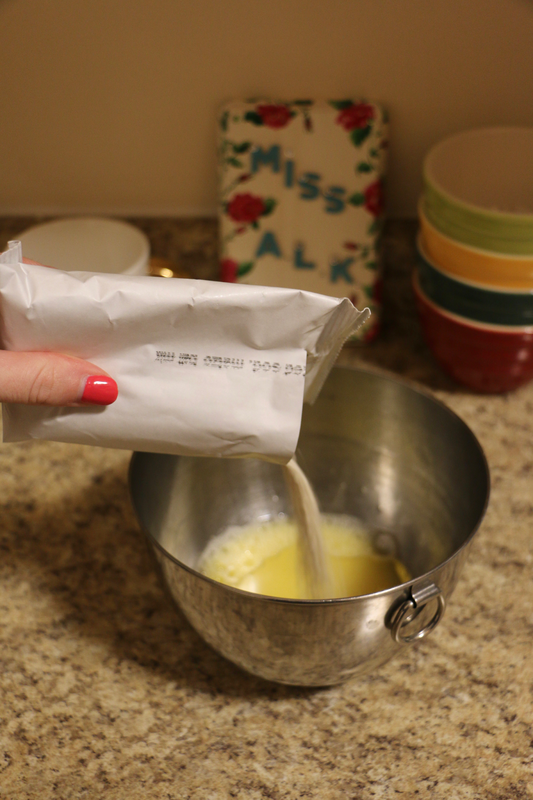 Prepare the matzo balls according to the directions on the package (this is what the eggs and canola oil is for). You have to cook them in very hot boiling water for them to properly form and not fall apart. I prefer to cook them in a pot of plain water instead of the soup broth- I cook the matzo balls separately and then add them into the soup after they're cooked. 2. 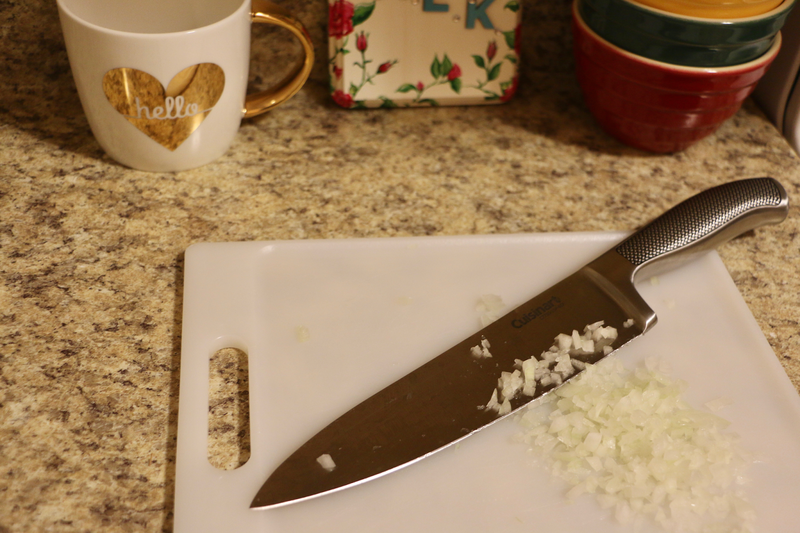 Finely chop half an onion (or more if you love onions!). 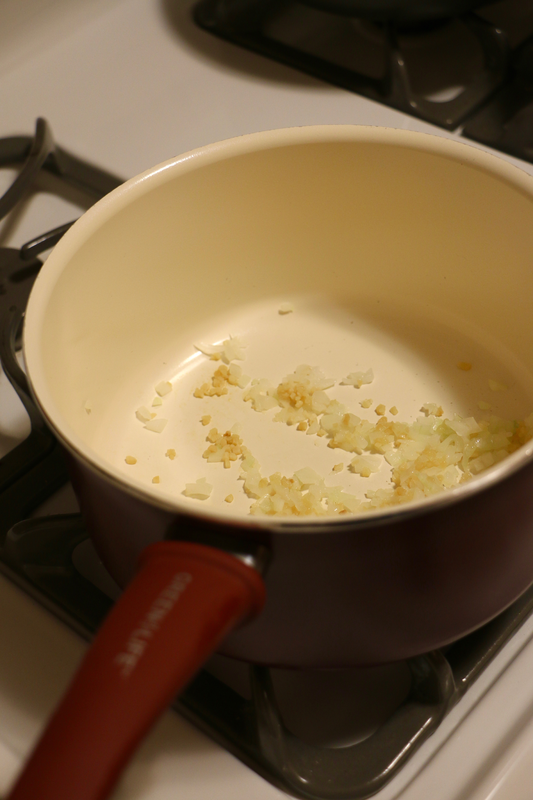 Next saute the onion and tablespoon of minced garlic for a couple minutes, until both just begin to brown. 3. 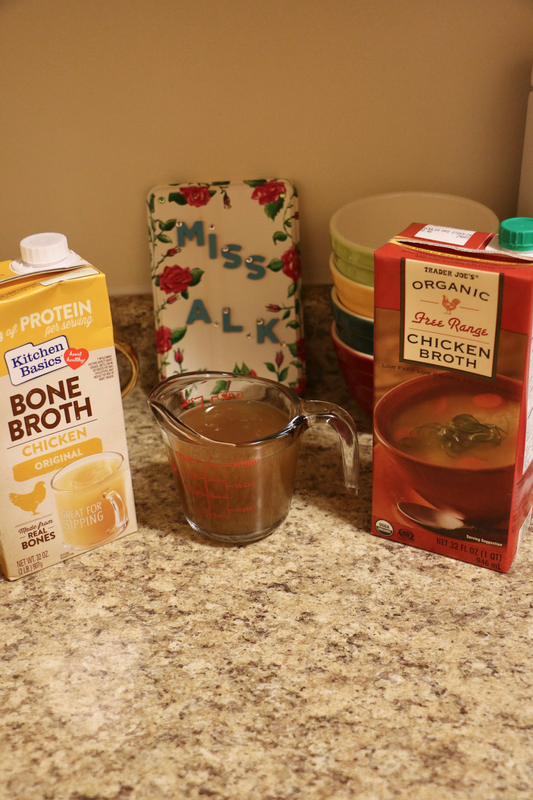 Combine 3 cups of chicken broth and 3 cups of chicken bone broth in a pot. 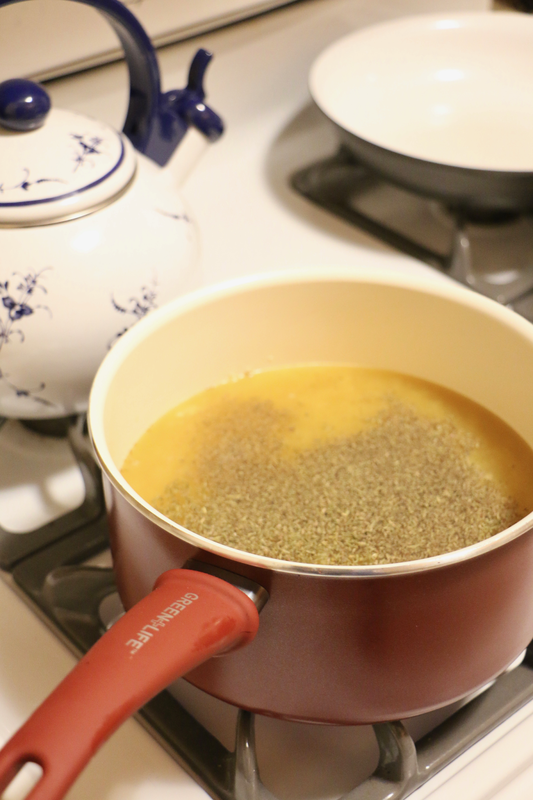 I like to mix the two types of broth for a richer flavor! Add the cooked onion and garlic mixture, thyme, and salt and pepper to taste. Bring to a boil. 4. 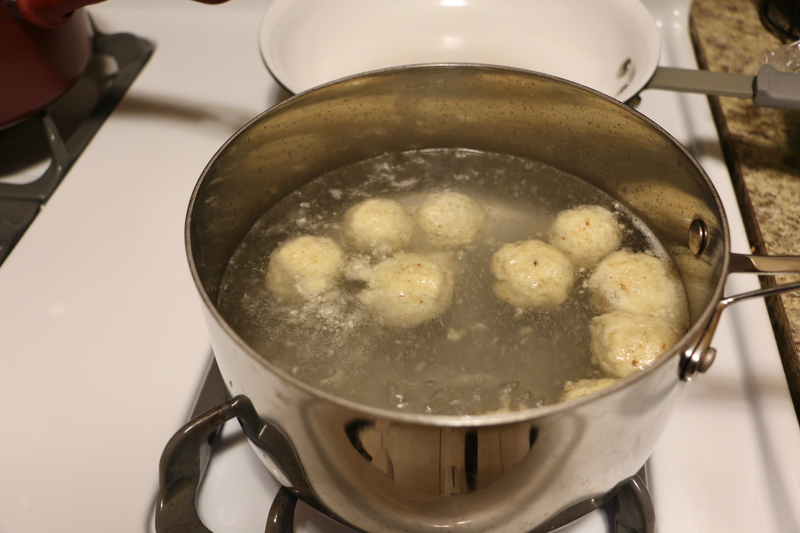 Add the cooked matzo balls to the broth mixture. Bring heat down and simmer for 10 minutes. Then enjoy your delicious matzo ball soup! This has seriously become one of my go-to comfort food recipes this fall and winter. It's easy to make, absolutely delicious, and one bowl of this soup warms you right up. Hope that you enjoy this recipe, and happy Hanukkah to those celebrating right now! I did;t know you were part Jewish, I think it's so cool your parents made an effort to incorporate some aspects of Jewish culture into your upbringing. I LOVE matzo ball soup but I've never made it myself. I will have to try your recipe! 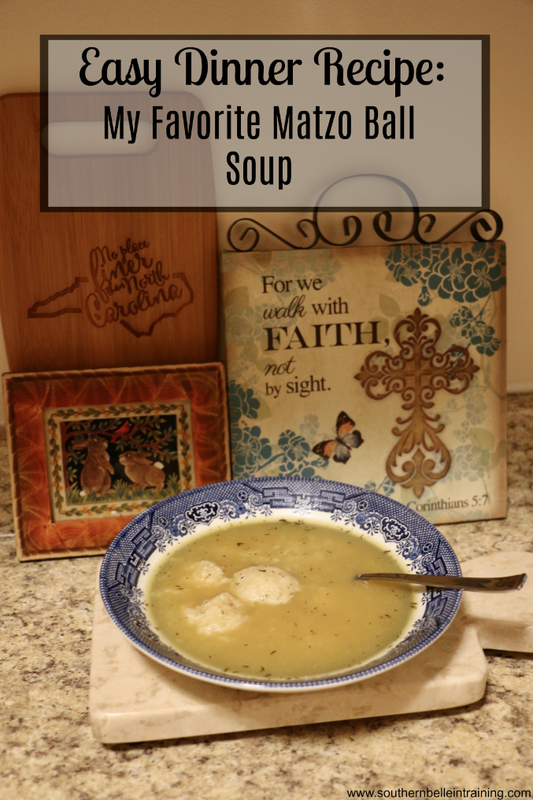 I've never had Matzo Ball Soup -- looks so good! YUM I love matzo ball soup! I'll have to try out your recipe! This sounds amazing! I love trying different foods from different cultures. I've never had any Hannakuh or Seder styled food, so I would love to try! I had no idea you were half-Jewish. That's so interesting. I have two good friends that are Jewish, and I worked at a Jewish all-girls summer camp a few years ago even though I'm not Jewish. It's so interesting to learn about different traditions. 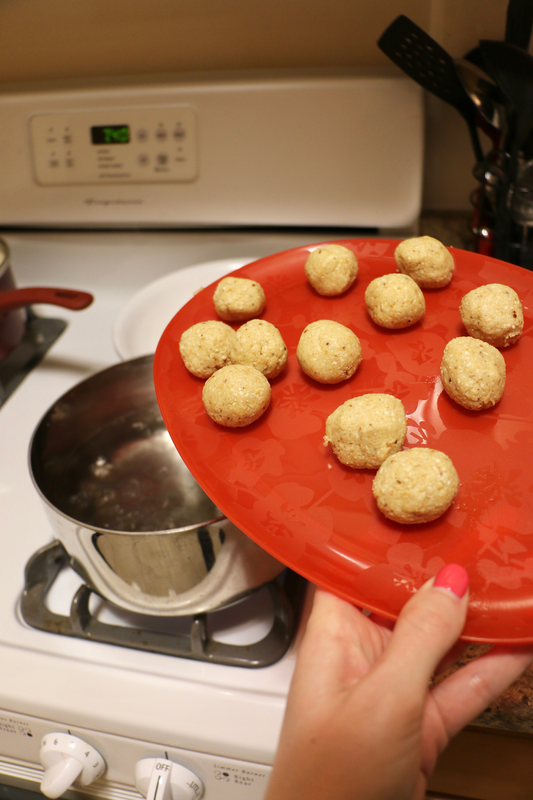 I've had matzo ball soup before, but it'd be awesome to make some of my own. Thanks for sharing this! Yum this looks so good! I love family traditions/recipes. This looks amazing! I have never had this soup before. May need to try it! Have a great holiday! this is incredible, i would love to try this! Love this recipe and definitely will try to recreate it. Yummy! Whenever I stay at the Thompson Toronto I always have to get their matzo ball soup. I've never made it myself though, I'll have to try your recipe! I've never tried this type of soup before, but it looks so yummy & comforting! I LOVE matzo ball soup! An old jewish roommate made some for me once when I was sick and to this day, I still reach for it when I catch a cold! This looks so yummy! Perfect for a cold winter day! I'm Jewish and so I grew up eating matzo ball soup. I'm partial to my aunt's recipe, but yours looks amazing, too, major props! Jewish cuisine is so hearty and comforting. I was born in Long Island NY!! Matzo ball soup is probably one of my favorite foods! So cozy!